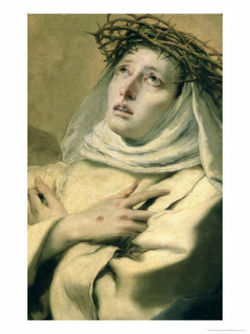 St Catherine of Siena born in Siena, Italy (b. 1347, died 1379). She lived at the time of the Crusades, the Great Schism, civil wars and the Black Death. Catherine was a virgin, not a nun but a layperson of Third Orders who was devoted to the religious Dominicans. Her growing reputation as a worker of miracles, caused the public and Popes to turn to Catherine in all kinds of difficulties. Catherine is best known for urging Pope Gregory XI to return to Rome. Christ was her interest, her life and her passion. Catherine became the first woman Doctor of the Church also called the Doctor of Unity. Catherine was the youngest of 25 siblings born to father Giacomo di Benincasa and mother Lapa. As a child, Catherine was so merry that the family gave her the pet name of Euphrosyne, which is Greek for Joy and also the name of an early Christian saint. At age six, she had the first of many visions that may have determined her vocation. She had a vision of Christ seated in glory with the Apostles Peter, Paul, and John. A year later the little girl made a secret vow to give her whole life to God. Prayer and solitude with Christ was her passion. At age sixteen, she was permitted to enter the sisters of Penance of St Dominic. Later in life, her visions led her to receive the stigmata. Seeking unity and reconciliation for God's sake, she wrote deliberately and boldly to those in authority. For 74 years, Popes resided in Avignon, France. Pope Gregory XI lived in Avignon, France for fear of being poisoned. Catherine pleaded with the Supreme Pontiff to return his residency to Rome, thanks to Catherine he did. The Queen of Naples, Giovanna, was accused of murdering her husband and supported the anti-pope. St. Catherine wrote, "You know that you do ill, but like a sick and passionate woman, you let yourself be guided by your passions." Catherine risked death by sending such words to the authorities but she was not afraid, filled with love from Christ. Civil war broke out between the Holy See and Florence. Nearly all of the Papal states rose in insurrection. The Pope sent Catherine on a mission to secure neutrality and to make peace. Although unsuccessful, she made a profound impression. Catherine was regularly consulted by the papal legates about the affairs of the Church. Catherine worked tirelessly for the Crusade against the Turks. The plague known as the Black Death was spreading throughout Europe. Catherine and her helpers worked incessantly to relieve the suffering. Nearly a third of the population had died. She tirelessly worked to comfort those stricken, preparing them for death and even burying people with her own hands. Catherine nursed patients to recovery and her wonderful words of joy healed, which brought about many conversions. Among those who owed their recovery directly to Catherine were Raymund of Capua, Matthew Cenni, Father Santi, and Father Bartholomew, all of whom contracted the disease through tending others. The works of St. Catherine of Siena rank among the classics of the Italian language, written in the beautiful Tuscan vernacular. Her writings consist of nearly 400 letters and a series of prayers. Her most famous writings, the Treatise on Divine Providence also known as the Dialogue. Also, her smaller work called the Treatise on Consummate Perfection. St. Catherine died at age 33. Eighty-one years after her death, she was canonized by Pope Pius II. Pope Paul VI made her a Doctor of the Church October 4, 1970. Pope John Paul II marked the 25th anniversary of being a Church Doctor by honoring her "impassioned liveliness" and "freedom of initiative." St. Catherine is the patroness Saint of Italy. This page was last modified on 13 July 2016, at 00:43.